[br] Hello! Jen from A beauty junkie in London here! Whilst Charlotte is away on her holidays (not that I’m jealous at all) I’m doing a little guest post for you! 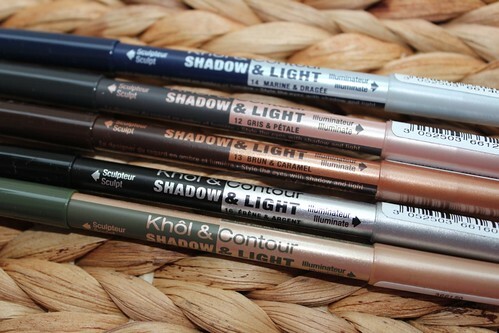 Here’s a little look at the new Khol & Contour Shadow and Light Pencils* from Bourjois. 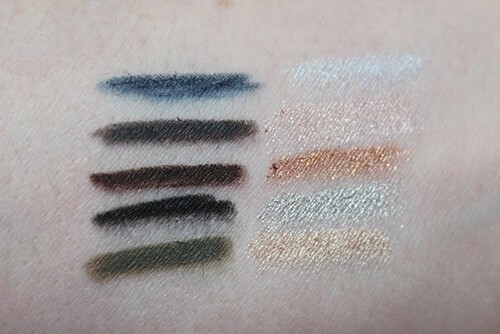 These pencils each include a light and dark liner shade that compliment each other. The light shade in each of the pencils has a metallic sheen to it whilst the darker one is matte. Shade wise, the dark shades are all consistently pigmented and feel creamy when used. Of all of them, the navy blue is the weakest in colour pay off. The paler shades on the other hard really vary, of course as they are the paler shades the colour pay off naturally contrasts with the darker ones… but when looked at alongside each other the ‘dragee’ shade (the one with the blue) is a bit lame. So overall, the marine/dragee shade is my least favourite. 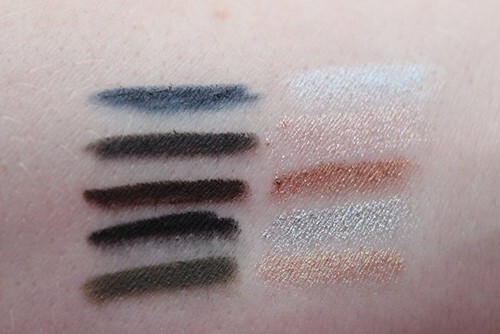 I also found that the texture of the lighter shade was a little crumbly, with the tip of the pencil breaking off of when I went to swatch them – because of this I’d definitely swatch them before first use as you don’t’ really want it going in your eye. The two stand out colour pairings are the khaki and the champagne gold and the brown and the ‘caramel’ purely on the strength of the pigment and how the colour combinations are safe and neutral – but still slightly more unusual. If I was to choose one, I’d go with the khaki/champagne! If you would like to submit a non-commercial post to be considered for inclusion on Lipglossiping.com, please email for more details. the khaki/champagne one is my favourite! I’m a bit disappointed as none of those pairings really scream out to me – although I think it will be a relief for my credit card!